Last month I got a request to review the demo (“The Hard Reality”) of the Italian Gothic Metal band SYNFUL IRA. SYNFUL IRA was formed in 2007 by guitarist Fabio Balducci, who also plays guitar in the symphonic Power Metal formation ANCIENT BARDS. 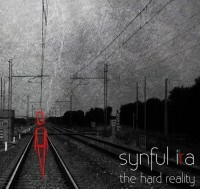 Currently the band (SYNFUL IRA) is working on their debut full-length, but in the summer of 2010 (August to be precise) they released the demo “The Hard Reality”, which contains five songs. The band’s musical influences are said to come from NIGHTWISH, WITHIN TEMPTATION, EVANESCENCE, LACUNA COIL, STRATOVARIUS, SIRENIA, UNSUN and similar. When the debut album will come out is still unknown, as the band is looking for a label to take care of those steps. What is known, is the title: “Between Hope and Fear”. Meanwhile, there’s the demo, which begins with “Sound Of Life”, an intro. You get clean guitarwork, a solo and atmospheric backing. This piece alone sounds close to SAVATAGE, which is of course very nice. Then the keyboards (piano) come in to take over and Letizia “Leira” Chiozzi begins the speech. This connects neatly with the song “True Lies”, where the music comes bursting in. And yes, melody is key and it does sound like what you would expect from a Gothic Metal band. The guitars offer heavy grooves, though with melodic leads, assisted by the piano. The clean verses are first like the aforementioned intro, then power is added. And the whole gets melancholic in the chorus. All in all, good stuff. “Behind The Suspect” also has clean guitarwork at first, with soft symphonic backing. When drums and bass fall in, the building really begins until all elements are ready for take-off. Dark riffing, symphonic leads.. and go! Result? Fast double bass Power Metal, which is a bit suprising (and not) if Fabio created SYNFUL IRA to play a different kind of Metal than with ANCIENT BARDS. The piano is a key instrument in this song and you get a nice contrast between the verses and the chorus, which is touching/emotional/dark/gloomy. Better use more than one term than none, right? 😉 I wonder is this is a love song, since there’s a spoken part about wanting someone. It does sound a bit strange, especially with the effects. But overall, the band have done a good job again, musically and vocally. “Shining Tracks” is a midtempo groove Metal song with Gothic influences. It does sound like a power ballad, I must say, but that’s only a thought. As the song advances, all doubt is removed. The guitars counter with the simple piano melody and Letizia’s soft/dreamy vocals. The chorus is where all power, rather atmospheric, is unleashed, creating a hymnic piece. I like it. The (Bluesy) guitar solo that follows is inline with the rest of the music. Last but not least, there’s “Fatal Temptation”. The blunt riffing reminded me of FEAR FACTORY and DIVINE HERESY. Following is a funky midtempo part with electronic backing. Compared to the previous songs, I have to say the band did take care of the variation aspect of this release. The vocals are high in the mix. Not that it’s a problem, but maybe they’re a liiiiitle too high. The keyboards confirm their dominance in the melodic department. Full power is saved for the chorus, which is again well done, but sounds like Pop with distorted guitar input. SYNFUL IRA is thus at work for their long-awaited debut album “Between Hope and Fear”. This 5-track demo is a good way of showing what this band can do. The production – yes, it’s a demo, but still – is good, but the drums sound too much like a computer, even if they’re not. The songs are very accessible, not too technical and even radio-friendly, therefore not aiming solely at a Metal audience. This also helps to make one band distinct from the other you play in. Melody is a key factor in the compositions, whereas rhythm and power are delivered by guitars and drums. Conclusion: “The Hard Reality” is a good demo and I wonder how good the material sounds live. The guys and girls certainly have the potential to create solid and entertaining stuff.